About a year ago, I lost out on a potential client, and I know for a FACT that it was because of my resistance to hopping on a video call with them. The thing is, I used to HATE them because I’m very shy when meeting new people and pretty introverted. I think more clearly when I write it out because I can focus on the project. Even though I meditate and work on staying present in my regular life, video calls with strangers would quickly get an “OMG, I look so nervous, they obviously hate me, I can’t stop smiling like an idiot, I sound so dumb” mantra running through my head. I still get nervous, but I’ve come up with some ways that make it easier for me to manage. If you’re a freelancer or a solopreneur who provides a service instead of products, chances are you occasionally (or a lot!) need to speak with prospective clients too. Though some people are fine with phone calls, video chatting on Skype or Google Hangouts is preferred. You can’t blame people for wanting to hop on a call and get to see you’re a real human and get a sense of who you are before handing over their trust and their money to someone they’ve never met on the internet. I also do recognize that many things are more easily explained when you’re talking, so it makes sense to talk it out. One thing before I get to the tips, please don’t forget that you should be evaluating your potential client as much as they’re evaluating you. Do you want to work with this person? Does the job light you up? Make sure the answers to both are yes. 2. Check out your video setup. Having poor lighting and an unflattering angle might make you feel insecure, which the potential client could view as you being insecure about your work. 3. Understand and accept that if you’re shy some nerves are inevitable. Don’t fight them; it will only make it worse. Try reframing the buzz as excitement, after all, that’s true! You’re probably eager to be of service and make a good impression because you’re excited to work with this person. It’s fine. If the potential client judges you too harshly for being nervous, you probably don’t want to work with them anyway. 4. Do your homework so you know who you’re talking to and how you can help them. Probably the most important piece. You want to feel prepared and ready to be as helpful as possible. Understanding some of who they are and what they do can help you have answers and ideas for them before the call even starts. 5. Try to find a commonality ahead time that you might be able to bring up on the call. 6. Map out how you plan the call to go. Don’t try too hard to stick to the plan if that’s not how the conversation goes naturally, but it’s best to have a guide to avoid any awkwardness. Structuring the call can also make it more productive for you both. Use your homework and also bring up common questions they might have, such as rates, how you work, contracts, etc. 7. Ask all the questions! Come up with 2 to 3 questions before you get on the call. Blanking out when a client asks “do you have any questions for me?” is super easy to do when you’re stressed. At least, it is for me. Prepare a few questions while ahead of time. If the client answers all your questions before you get to ask, just let them know if you need some more time to digest everything and send any additional questions in an email. I haven’t run into anyone who took issue with this, so don’t beat yourself up if you get stumped. Practice active listening and make sure you’re fully understanding the problem the potential client or customer needs your help with and if you are truly capable of solving it. 10. Wrap up by thanking them for their time and talking about next steps. It seems obvious but just plan on doing it, so you both know what happens next. 11. Do something to take your mind off of the call immediately afterward. Color, read, play a game, do a super focused half-hour work session, something! I know if I don’t do this, I’ll ruminate for a bit with unhelpful thoughts like “Did I bomb that? Did I smile too much? Do they think I’m a moron?” You’re done with the call and you probably did better than you think you did. Even if you didn’t, those thoughts aren’t going to change anything. For more ideas on self-care post call, check out my Pinterest board Self-Care for the Solopreneur. 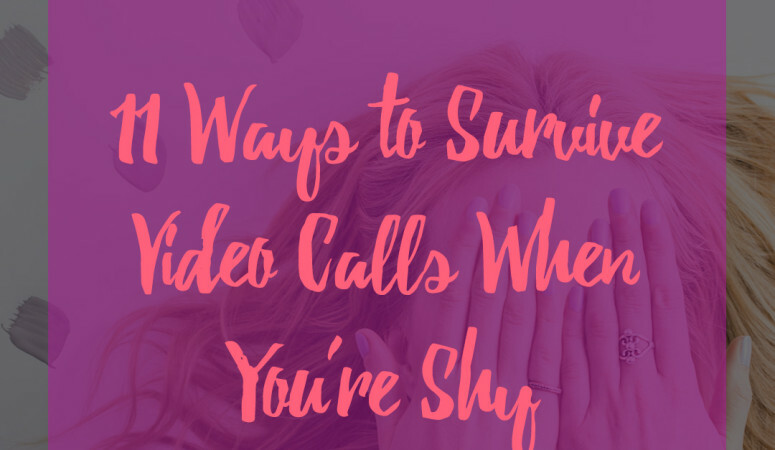 Do you do video calls with potential clients? How do you feel when doing them? What are some of your tips for success? Let us know in the comments! Oh my gosh…THANK YOU for this post. I am struggling with this very thing right now. It’s keeping me from making my services page live. And it’s so frustrating to find post after post saying “just do it.” Uh…I WISH it was that easy! Hi Nicole! So glad it helped! I totally feel you on this. Thanks for stopping by.